The formal unveiling today (Jan. 16) of a NASA deal to add an inflatable room developed by commercial company Bigelow Aerospace to the International Space Station is a forerunner of things to come. The private space firm has its eyes on setting up its own commercial space outpost, which it is calling Alpha Station. The new room to be attached to the International Space Station — a Bigelow Expandable Activity Module (BEAM) — will remain part of the orbiting laboratory for at least two years. During that time, astronauts will monitor the environment inside the module, recording a variety of parameters including temperature, pressure and radiation levels. According to company details provided to SPACE.com, Bigelow Aerospace officials intend to use the BEAM to further validate the promise and benefits of expandable space habitats. 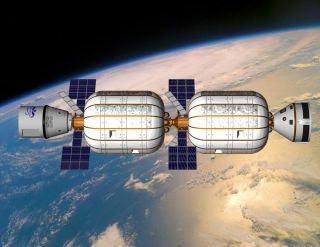 Bigelow Aerospace is pushing forward with Alpha Station, which it bills as the "historic first commercial space station." The station initially would consist of two BA 330s. The company plans to have the two BA 330s ready by late 2016. Alpha Station would be the first of a number of commercial Bigelow space stations deployed as demand grows and the on-orbit industry matures. Bigelow Aerospace is open to entering into joint ventures with interested partners, be they governments, corporations or even individuals, for future stations. "Nations such as Japan, Canada, Brazil, the United Kingdom, the Netherlands and Sweden could secure the future of their human spaceflight programs and dramatically increase the size of their astronaut corps. Smaller countries with no human spaceflight experience such as Singapore or the United Arab Emirates could take their first bold steps into space in a rapid and affordable fashion," according to a Bigelow Aerospace document. "The key to unlocking the potential of such opportunities is affordability," the company observes, and is rolling out a description of costs “that represent a sea change from historic aerospace pricing." Astronaut Flight Costs: $26.25 - $36.75 million for a 60-day stay, depending on taxi selected. Lease Block Cost: $25 million for exclusive use of and control over 110 cubic meters of volume for a two-month period. Naming Rights: Full Alpha Station yearly for $25 million; half of Alpha Station (one BA 330 module) yearly for $12.5 million. Bigelow Aerospace would be able to transport an astronaut to Alpha Station for $26.25 million for countries, companies or even visiting individuals that wish to utilize SpaceX's Falcon 9 rocket and Dragon capsule. Using Boeing’s CST-100 capsule and the Atlas 5 rocket, astronauts can be launched to Alpha Station for $36.75 million per seat, company officials said. For clients that wish to enjoy exclusive access to and control over their own on-orbit volume and facilities, Bigelow Aerospace customers can lease a third of a BA 330 habitat (roughly 110 cubic meters, equal to an entire International Space Station module) for a period of 60 days for $25 million. "Whether the customer is NASA, international clientele, corporations or even wealthy individuals, Bigelow Aerospace stands ready to leverage its robust, affordable technology to implement exceptional human spaceflight missions," the Bigelow Aerospace document concludes.